It’s not likely that any of the football standouts from historically black colleges and universities (HBCUs) will hear their names called Thursday on the first day of the NFL draft in Philadelphia, but there could be some really good players selected the following two days. These players may not be household names, but they have put together sensational college careers. For a model, look at a year ago, when South Carolina State defensive tackle Javon Hargrave was taken in the third round by the Pittsburgh Steelers. Hargrave emerged as a starter and helped lead Pittsburgh to the AFC Championship Game. It shouldn’t be long before Hargrave becomes a Pro Bowl player. Here are some key players to look for as the draft unfolds. Tarik Cohen is one of the top running backs in college football. He has tremendous speed. With his size, quickness and talent, it’s hard to get a hand on him. Cohen knows exactly when to cut against the grain to make a big run. Cohen set single-season records in rushing (1,588) and touchdowns (19). He had four 200-yard rushing games last season. He is the Mid-Eastern Athletic Conference’s all-time leading rusher, with 5,619 yards in his college career. According to NFL.com/draft, Cohen uses a bounding, bouncing approach to the line of scrimmage, reminiscent of Steelers running back Le’Veon Bell, but he’s far less likely to finish downhill and instead looks to break it wide and outrace defenders. He’s an electric playmaker who needs touches, but he’s too small to handle much of an NFL carry count. Cohen gets easy separation as a receiver out of the backfield or from the slot, and he will likely be used as an updated version of Philadelphia Eagles running back Darren Sproles. Tennessee State offensive lineman Jessamen Dunker runs a drill at the NFL football scouting combine in Indianapolis, Friday, March 3, 2017. Jessamen Dunker does a great job of moving his feet. He has the quickness to make that lead block in the running game, as well as the ability to drop back and provide good pass protection. Dunker helped Tennessee State’s offense produce 415.1 yards a game. 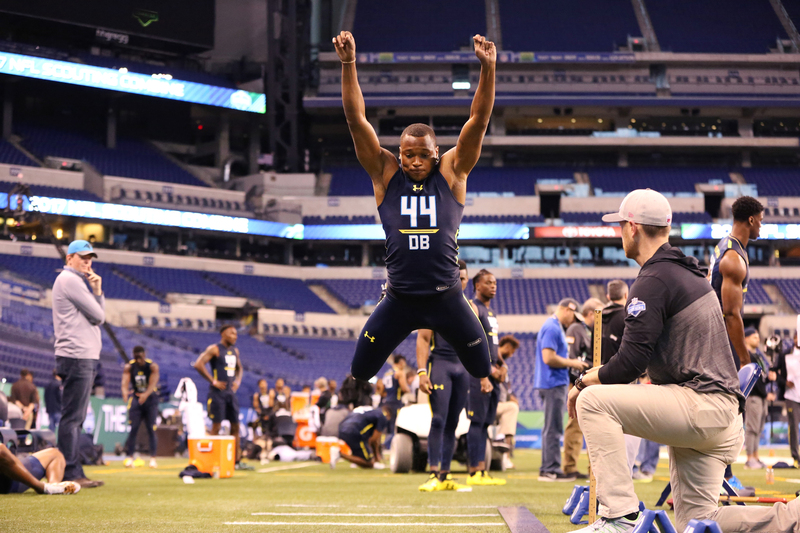 According to NFL.com/draft, Dunker is an excellent athlete, but he is raw and may not have enough core strength to consistently hold up against NFL power. His best chance is with a zone-oriented rushing team. But he will still need time to improve his technique and strength before he could become a factor on the depth chart. Javancy Jones is one of the best defensive players in the Southwestern Athletic Conference (SWAC). He has good anticipation and does a nice job of making contact. Jones had 82 total tackles and 19.5 tackles for loss. He had a great effort in the East-West Shrine Game, picking up four tackles and one tackle for loss. According to NFL.com/draft, Jones has good size and physicality and will get home run grades for leadership and character, but making a roster out of camp could be difficult. He’s not a naturally agile, flexible athlete and may be forced to learn a new position on the next level. 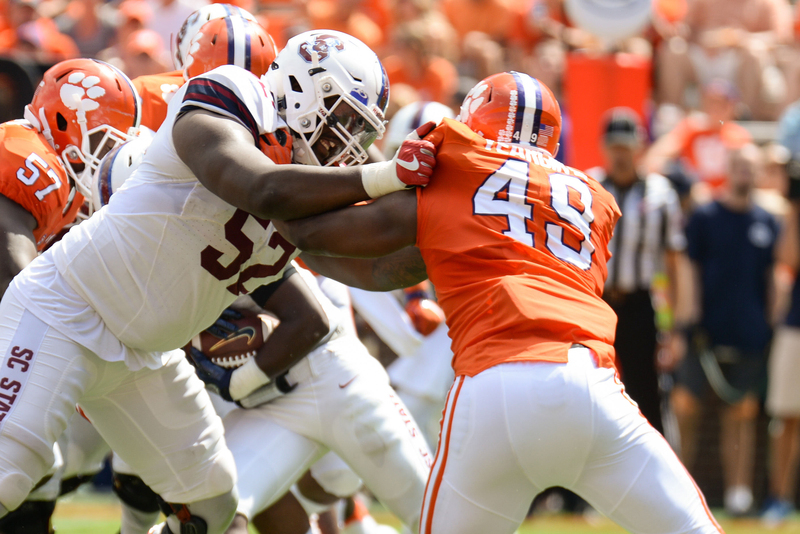 South Carolina State’s offensive lineman Javarius Leamon (52) blocks Clemson defensive lineman Richard Yeargin (49) during 2nd half action between the Clemson Tigers and the South Carolina State Bulldogs at Memorial Stadium in Clemson, SC. Javarius Leamon has great size and length. He has the athletic ability to cover a lot of ground. He has good footwork. Leamon is a good run blocker and has the skill set to pass protect as well. According to NFL.com/draft, Leamon has the physical traits that will get the attention of NFL evaluators, but the tape shows a player lacking in foot quickness, hand strength and technique. The technique can be worked on, but the lack of hand strength, upper body power and foot quickness could be hard to overcome. Leamon is a developmental project who could need a year on a practice squad before he’s ready to challenge for a roster spot. Tennessee State defensive back Ezra Robinson competes in the long jump at the 2017 NFL football scouting combine Monday, March 6, 2017, in Indianapolis. Ezra Robinson is a great all-around performer in the secondary. He knows how to come up and stop the run. He’s a good open-field tackler. Robinson had 42 total tackles (31 solo). He’s magnificent against the pass, too. He had five interceptions for 149 yards and returned two of the picks for touchdowns. According to NFL.com/draft, Robinson has adequate height and length for the position and has posted good ball production over the past couple of seasons. Robinson has enough athleticism to make even more plays on the ball; however, his lackadaisical field demeanor prevents it. Robinson’s lack of competitiveness and toughness as a tackler will be an immediate turnoff for many teams. Grover Stewart had a tremendous year at Albany State. He has the ability to play the run. He’s always in good position to make plays. He had 35 tackles (26 solo) and 12 tackles for loss of 61 yards. He has the strength and mobility to get into the backfield quickly. He had 7.5 sacks last season. 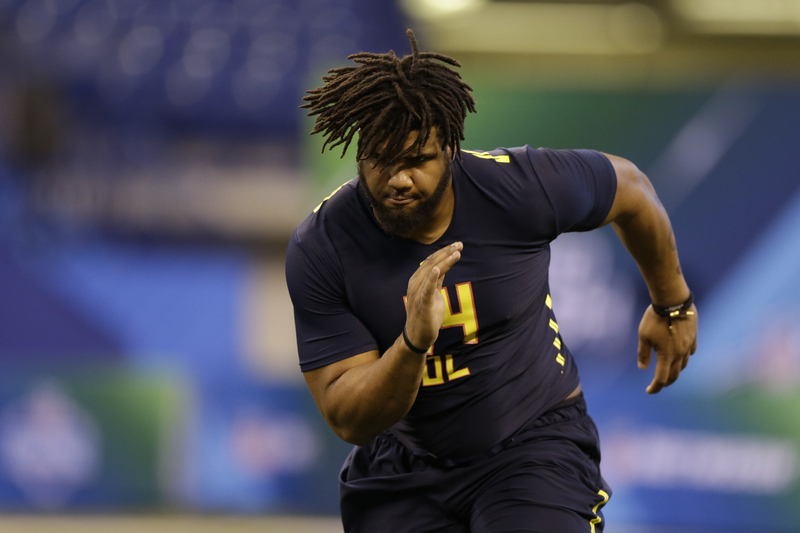 According to NFL.com/draft, Stewart’s girth, power and potential could lead a team to take him on the third day as a developmental run-stuffer. Stewart is still raw, but additional technique work could unleash a much more capable interior defender. The jump in competition will take some time to adjust to, but like other small-school interior defenders before him, Stewart has the potential to work himself into a more prominent role within two or three years. Jylan Ware has the ability to open up gaping holes in the running game. He has great strength and quickness. His size and range make him a good prospect. Ware can move extremely well from side to side. He’s a good pass blocker, too. According to NFL.com/draft, he has the traits and athleticism to potentially advance more quickly than others with the developmental label. While his pass sets need work, he seems to have a good feel for how to use his long arms and strong hands. He will need time to add more bulk to his frame to handle bull-rushers, but he has some tools and might have a future in the NFL with more experience and coaching. 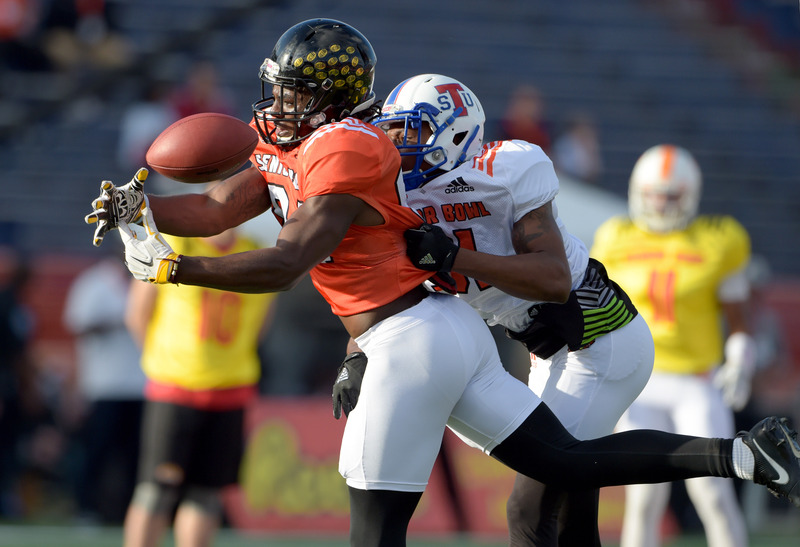 South squad wide receiver Chad Williams of Grambling State (84) catches a pass against cornerback Ezra Robinson of Tennessee St. (31) during Senior Bowl practice at Ladd-Peebles Stadium. Chad Williams can run the deep pass patterns. He can go up and make the big catch in traffic. He has good quickness and moves that allow him to get open. He was a clutch receiver at Grambling State, leading the Tigers to the SWAC title and to the Black College national championship with a win over North Carolina Central in the Air Force Reserve Celebration Bowl. Williams had 90 catches for 1,337 yards and 11 touchdowns for the Tigers last season. According to NFL.com/draft, he was heavily targeted and highly productive against a lower level of competition. Williams has decent size and ball skills but looks slow on tape with disjointed route work. He needs to run well at his workout, but even if he does, he’s a developmental prospect.